The long and dull day started with free breakfast courtesy of Best Western and then a brief jaunt into the local mall to get more shampoo from Safeway and lunch from Subway again. The reason why this was going to be a dull day was because it was going to mainly involve driving. We set ourselves the target of getting to Joshua Tree National Park for the following day, which meant we had to cross all of Arizona and half of California to get there. For those not familiar with the scale of American geography, that’s a long way. It’s about 420 miles, and in England, 420 miles puts you into another country. Or in the sea. If you live in the south you can maybe spend 420 miles getting to Scotland but firstly most people wouldn’t try to drive it in one day and secondly, Scotland is another country anyway. So you obviously can’t drive that far without planning a few stops on the way. First up was the Meteor Crater ( www.meteorcrater.com ). It’s not very far from Winslow in the context of the day, but it was somewhere that Kas was keen on having a look at. Kev had been before, but it was 8 years previously, so why not go again ? After a little while it became obvious why not going again would have been preferable. Firstly, Meteor Crater is privately owned. That means that it has to be funded privately. Although the owners claim they maintain the best interests of the site there isn’t actually a great deal there. You can walk up to a viewing platform with various levels, from which you can peer into a hole. OK, it’s a big hole, but when you are half a day from Grand Canyon, there are better holes nearby. They have some of those telescope things which cost a quarter to use for a couple of minutes, but they don’t magnify enough for you to be able to tell what you’re looking at. Then there is a large RV park, full of large RVs, which you probably have to pay for too. And finally there is a visitor centre. For some reason, it seems to focus on space exploration. Maybe because there’s only so much you can do in trying to describe a hole. We didn’t bother with the film shows because we had already lost enthusiasm for the place. There was also a café with a fairly limited selection of unappetizing looking snacks. And to enjoy this tremendously underwhelming experience you have to pay $12 each. Just as well we didn’t have a family in tow, we wouldn’t want to spend $50 for a place that kept us busy for a little over 30 minutes. Anyway, we bought ourselves the first ( but not the last ) big bucket of coke and hot footed it back to the car to make as speedy an exit as we could possibly manage. I guess it’s not that it’s a particularly bad place, it’s just that compared to some of the NPS run sites we’d been to, this seemed like it was just a conglomeration of various mediocre and unrelated attractions at a price which was fairly high. You also feel that the money was just disappearing into the expansion of the mediocre attractions instead of being used to preserve, develop and foster understanding of the monument itself. 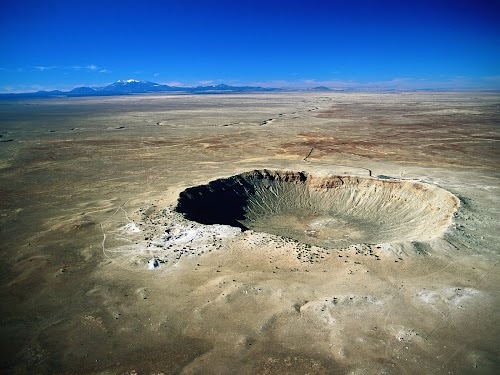 So next time I’m driving on I-40 through Arizona, and the kids want to go see the meteor crater, we’ll both just tell them to shut up, and drive straight past the place. Once you get past Meteor Crater, you are approaching Flagstaff again, and whilst I said that the drive east on I-40 is a bit dull because there’s nothing to look at, the drive west is quite entertaining because there are these enormous extinct volcanic mountains just to the north of Flagstaff and you don’t realize quite how big they are because when you first see them you are a very long way away. You gradually approach them and they get bigger and bigger until you realize they are massive. At this point you drive through a comparatively busy bit of freeway through Flagstaff, before heading back out into the countryside. As you pass Flagstaff you also change from dead flat, treeless desert to a few miles of what looks like high alpine scenery. There are a few hills in the road and it is suddenly surrounded by pine woodlands which block off the view. 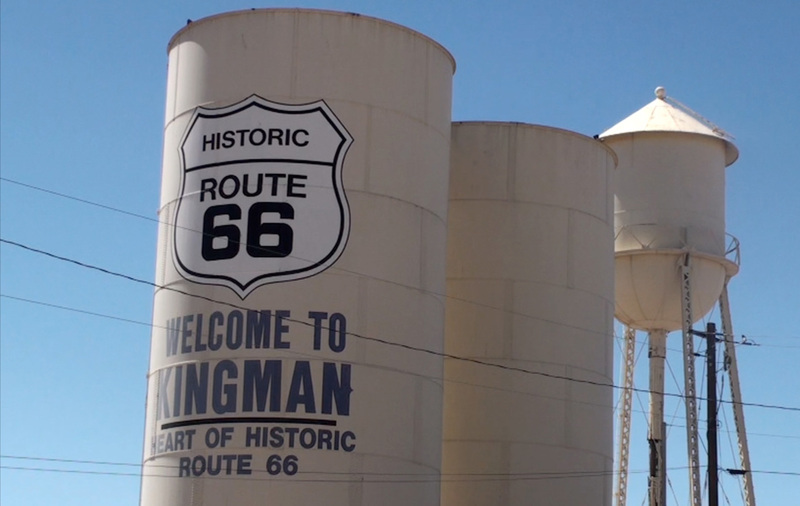 Eventually, you descend out of this bit and get back to more of the big wide flat desert, before reaching Kingman. Now, just over a week or so previously, when we did our Saturday afternoon drive through Las Vegas, we had promised to go back to Vegas over the Hoover Dam and spend a night there properly, and this would be where we would need to get off the freeway and head north to make this trip. In Winslow, however, we had decided we weren’t really that bothered, because going to Vegas would reduce the amount of time we would get to spend in Joshua Tree, as well as adding another 800 or so miles to the round trip. So all we did in Kingman was to pull on to the forecourt of a gas station, where we ate lunch, let out the Coke we had bought at Meteor Crater and then filled with fuel and bought more Coke. Enough of that, we’re probably not even half way there yet. Our route to Joshua Tree involved ducking off the freeway just before the California border and driving down through Lake Havasu City, before crossing over the Colorado at Parker Dam and following the one road across to the north side of Joshua Tree. 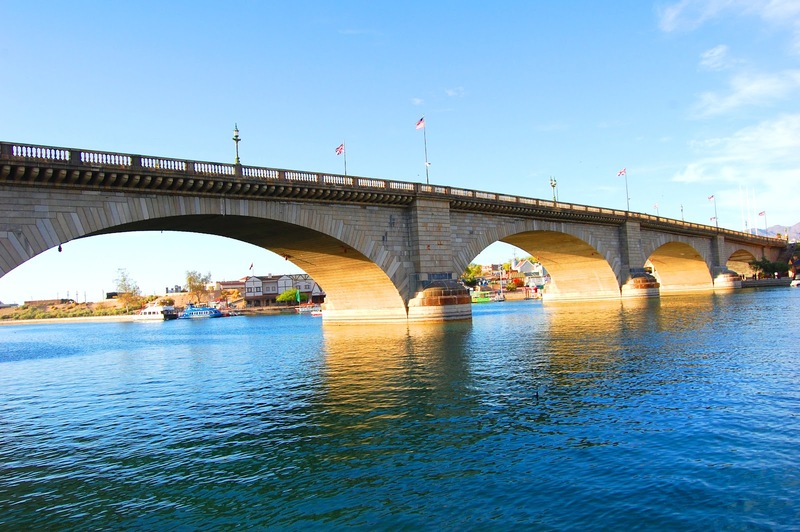 Lake Havasu City is home to an old incarnation of London Bridge. According to the book, the guy who bought it thought he was getting Tower Bridge. Sounds like a bit of a Sunday League error, so I’m not sure I believe it, but anyway, you have to stop and look at something like that. So we drove through apparently endless suburbs until we reached the centre and followed signs for the lake and bridge. We parked up and went for what proved to be quite a short walk. The bridge now spans a short stretch of lake between mainland and an artificial island ( well, it would be, because the lake is artificial as well ) which seemed to have a bunch of posh hotels. Having spent all day driving across a desert, it was strange to stop in a place with lots of greenery and people windsurfing. However, the problem with all that water is that it evaporates quite a lot, which means that the air humidity here is much higher than the surrounding desert, especially if you are very close to the lake. This basically means that your sensation of the ambient heat changes from warm air dryer to sauna. You go from hot but dry to roasting/melting/cooking. This is quite a shock after a day sitting in the air conditioned car, and down on the lake shore under the bridge it was truly hot. We elected not to stay for a drink or anything, it was just too hot for comfort. So we piled back into the air conditioned cocoon and pulled into the first available gas station for a 40oz bucket of Coke each and a tube of Pringles, before heading off south again. The road south from Lake Havasu City was much more heavily populated than I expected. It follows the river down for most of the way, and there seems to be a lot of new building work going on. Maybe this is a favourite retirement area, where the weather is consistently dry and warm to hot. 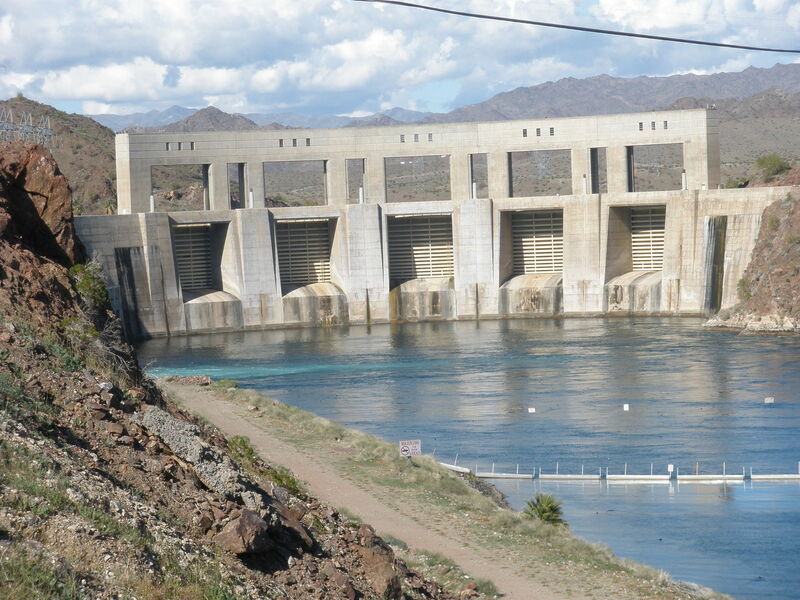 Whatever the reason, there isn’t a lot of wilderness between Lake Havasu City and Parker. At Parker we cut west and over the river, and so back into [California]]. The road to Joshua Tree from here is basically dead straight for most of the way, and leads you across some proper desert again. It was quite busy by now, because this seemed to be a favourite route home for some of the Labor Day traffic going back to LA and other large cities in coastal California. So progress was moderate at best. 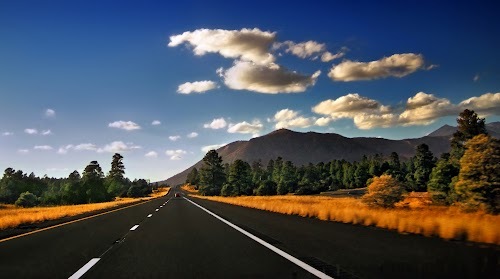 The road which looks dead straight on the map also has a lot of ups and downs in it, so although there are no curves, you can’t see far enough to overtake anyone, because there is always another hill crest coming up. The drive was also made more fun by the presence of a thunderstorm. At Rice we stopped briefly to dispose of the 40oz Cokes and we then progressed on towards our chosen stop for the night – Twentynine Palms. We arrived about 30 minutes too late to get into the National Park Visitor Centre, but at least their toilets were accessible, so some more of the 40oz Coke was disposed of before trying to find a hotel. I don’t think we had any particular plan, but we had developed a liking for the Best Western chain, and there was a conveniently sited one near the western end of the town on the main highway, so that’s where we chose. They had plenty of rooms, free breakfast and a pool, so we didn’t think about it for very long. In we go. We used the pool for a bit of relaxation just after we got there, and then headed off to find dinner. We both had numb minds after all that driving and Coke so we just pulled into the local Pizza Hut. I think we caught them on a bad night. It was getting quite late when we arrived ( around 8:30 ) and it was a public holiday, so it was not the normal standard of jolly service we expected. They had run out of quite a few things on the menu, mainly the healthy options like salads, so we ended up with old faithful – pizzas and garlic bread. While we were having this, we got the distinct impression that the staff would like us to leave. They weren’t actively obnoxious, they just didn’t seem interested in our custom. So the meal was a rather fast and unpleasurable affair. Still, no bother, because we both just wanted to get to sleep anyway.